This is our second eBook this year. We are a 5th grade class of special education students who love to write and publish books. We hope you enjoy our eBook. Thank you to all of our readers of our first eBook. Finally I get this ebook, thanks for all these 5th Grade: Reflections On Our Year I can get now! 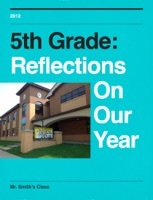 5th Grade: Reflections On Our Year was the best books I ever buy. 5th Grade: Reflections On Our Year did exactly what you said it does. I will recommend you to my colleagues. 5th Grade: Reflections On Our Year is the most valuable books we have EVER purchased. I'd be lost without this. I am completely blown away.